Construction and demolition (C&D) projects create an enormous amount of waste that is typically landfilled, but it doesn’t have to be anymore! Many facilities are now sorting construction and demolition waste to create a recyclable commodity and minimize the volume going into landfills! 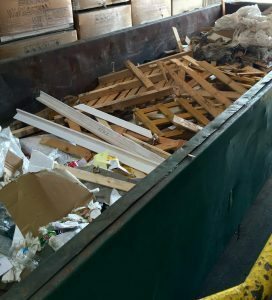 The materials removed from the waste stream vary by market and facility, but they typically include cardboard, metals, wood, drywall, plastics, and aggregate materials such as stone, concrete, and shingles. These facilities utilize both mechanical and manual sorting to ensure the highest recovery rate possible. The recycling rate for an average C&D container is around 80 percent! This is a fantastic way to reduce tonnage being landfilled and give a new life to these highly recyclable materials! We make it easy to make your construction projects more environmentally friendly! We work with state of the art facilities in the Mid-Atlantic Region to capture the greatest amount of recyclable products. We provide a single container at your site with maximized recycling at ours! We provide the hauling and reclamation of the materials. The process of capturing the recyclables is fairly simple in that the containers are dumped and screened for recyclable materials. This provides a great way to capture higher recycling rates while minimizing your landfill usage! We also provide all specific reports for our clients working for LEED Certification. Our report is specific to each dumpster pulled from the facility and the recyclables that are captured from that dumpster. We clearly show the landfill avoidance and recycling on our reports making it very simple for our clients to track it. We also offer specific tracking services for customers requiring it. Contact us today to see how we can help you manage and recycle the waste generated from your next construction project.